VALYA’s mission is to raise awareness in Switzerland about the importance of clean eating and to offer a practical solution to that end. 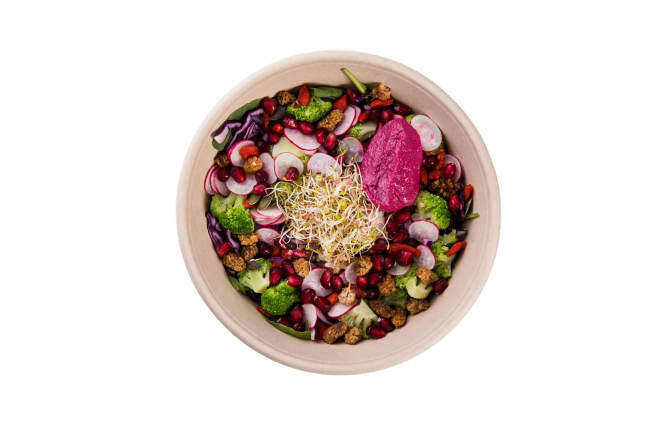 Two years after launching our home-delivered cold-pressed juice cleanses, we decided to open VALYA Juice & Superfood Cafe, Geneva’s first premium juice bar. In addition to juices, it will offer a whole range of superfood dishes using the most cutting edge nutritional science. 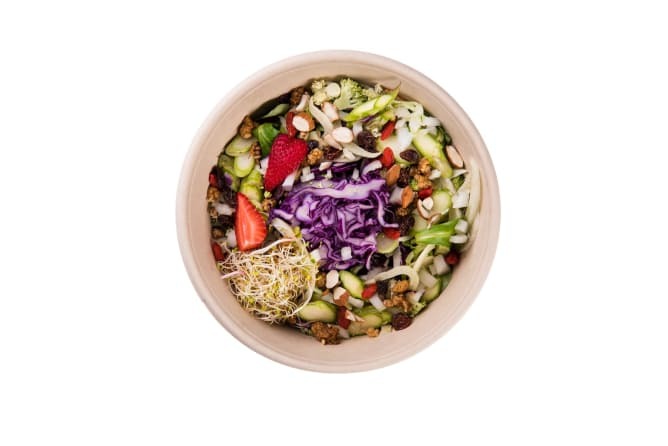 On the menu: salad bowls, soups, hot dishes, smoothies and cold-pressed juices – all organic, healthy and tasty! 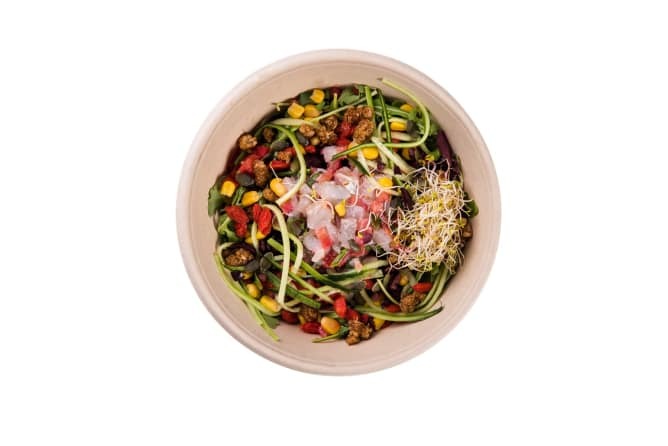 At VALYA Juice & Superfood Cafe, we offer an amazing selection of unique dishes that are nutritionally balanced, rich in vitamins, enzymes and antioxidants! And for convenience, you can also enjoy our creations to go! Even though construction on the space is well under way, there are still several things that need to be done: The interior of the cafe is very small so the additional funds would allow us to build a patio to create more seating. Secondly, the funds would go towards some essential equipment that is still needed. And if the first level is exceeded? First and foremost we would like to set up an eco-friendly delivery service. VALYA electric bikes would be able to deliver our products anywhere in Geneva! This project ended successfully on 5/10/2018 12:00! As one of our amazing supporters you'll receive: + two superdrinks: a VALYA cold-pressed juice or superfood smoothie, plus a ginger shot + a VALYA cooler bag to keep your drinks fresh + your name will appear on our contributors wall + participation in the "win your weight in VALYA juice" drawing. All our gratitude and a huge THANK YOU! As a Superfood Newbie you'll receive: + a VALYA bowl and two superdrinks: a cold-pressed juice or superfood smoothie, plus a ginger shot + a VALYA cooler bag to keep your drinks fresh + your name will appear on our contributors wall + participation in the "win your weight in VALYA juice" drawing All our gratitude and a huge THANK YOU! 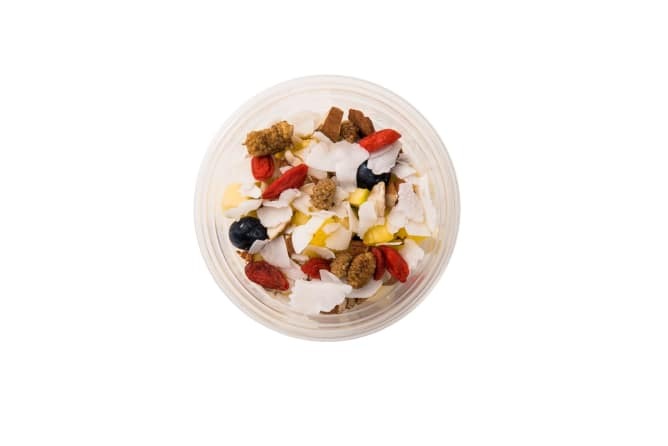 As a ACAI JUNKI you'll receive: + 3 large acai bowls + two superdrinks: a cold pressed juice or superfood smoothie VALYA, plus a shot of ginger + a cooler bag VALYA to keep your drinks fresh + your name will appear on our contributors wall + your participation in the draw to win your weight in VALYA juice! All our gratitude and a huge THANK YOU! At VALYA, we are sure of one thing: there is no age to practice a healthy diet! To transform you, and / or your child into a JUICE APPRENTICE you'll receive: + 12 cold pressed juices with vegetables for your child or teen OR 10 juices for you + 1 acai bowl + an cooler bag to keep your drinks fresh + your name will appear on our contributors wall + your participation in the draw to win your weight in VALYA juice! All our gratitude and a huge THANK YOU! 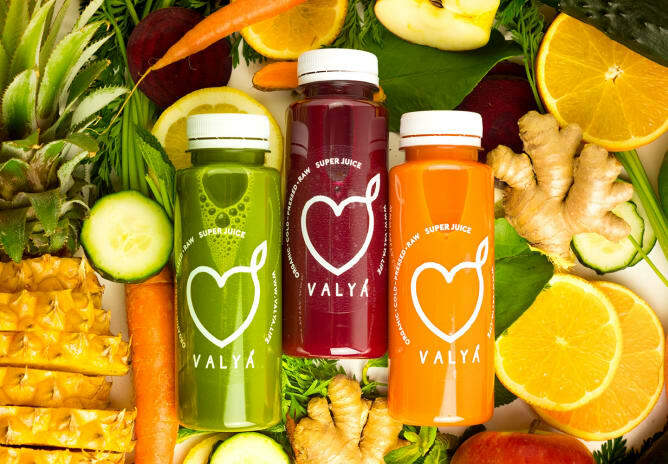 As a Superfood Adept you'll receive: + a 120 CHF VALYA gift card to explore all our super-products + a VALYA glass bottle to take your juices and smoothies everywhere! + our Juice & Smoothie recipes e-book in preview + your name will appear on our contributors wall + participation in the "win your weight in VALYA juice" drawing All our gratitude and a huge THANK YOU! No matter where you live in Switzerland, as a Detox Guru you'll receive: + a 3-day detox juice cleanse delivered to your home + a VALYA cooler bag to take your detox juices everywhere + our Juice & Smoothie recipes e-book in preview + your name will appear on our contributors wall + participation in the "win your weight in VALYA juice" drawing All our gratitude and a huge THANK YOU! For your generosity you'll receive: + a CHF240 VALYA gift card to explore all our super-products + a VALYA glass bottle to take your juices and smoothies everywhere + our Juice & Smoothie recipes e-book in preview + your name will appear on our contributors wall + participation in the "win your weight in VALYA juice" drawing All our gratitude and a huge THANK YOU! Living healthy is good, living a healthy life together is even better! So Love birds who like to share everything will receive: + a CHF 320 VALYA gift card to explore all our VALYA super-products + a VALYA juice workshop for 2 + 2 VALYA glass bottles to take your juices and smoothies everywhere + our Juice & Smoothie recipes e-book in preview + your names will appear on our contributors wall + participation in the "win your weight in VALYA juice" drawing x 2. All our gratitude and a huge THANK YOU! Health freaks will receive : + a CHF 600.- VALYA gift card to explore all our VALYA super-products + participation to two VALYA workshops of your choice + a VALYA glass bottle to take your juices and smoothies everywhere + our Juice & Smoothie recipes e-book in preview + your name will appear on our contributors wall + participation in the "win your weight in VALYA juice" drawing All our gratitude and a huge THANK YOU! We can't wait to meet our VIPs to thank you in person. In the mean time, you'll receive: + a CHF 1'200.- VALYA gift card to explore all our VALYA super-products + participation in three VALYA workshops of your choice + a VALYA glass bottle to take your juices and smoothies everywhere + our Juice & Smoothie recipes e-book in preview + your name will appear on our contributors wall + participation in the "win your weight in VALYA juice" drawing All our gratitude and a huge THANK YOU! What can we say? You're an angel! + join us to create a brand-new juice recipe! + a CHF 2'400.- VALYA gift card to explore all our VALYA super-products + participation in ANY and ALL VALYA workshops + a VALYA glass bottle to take your juices and smoothies everywhere + our Juice & Smoothie recipes e-book in preview + your name will appear on our contributors wall + participation in the "win your weight in VALYA juice" drawing All our gratitude and a huge THANK YOU! Illya and Valéry, who met during their studies at HEC Lausanne, decided to re-imagine health food offerings in Switzerland. In 2016, they founded VALYA, which offers organic and fresh cold-pressed juice boxes and detox cleanses delivered to your home. It has been a big success.